In his book, Rich Habits -- The Daily Success Habits of Wealthy Individuals, Tom Corley outlines several habits that distinguish the wealthy from the nonwealthy. It got me to think, How many people operate on autopilot and don’t stop to monitor their everyday patterns? Below I've summarized 19 of his habits for success (nine culled from his book and the next 10 from his recent article in Success) plus two of my own. 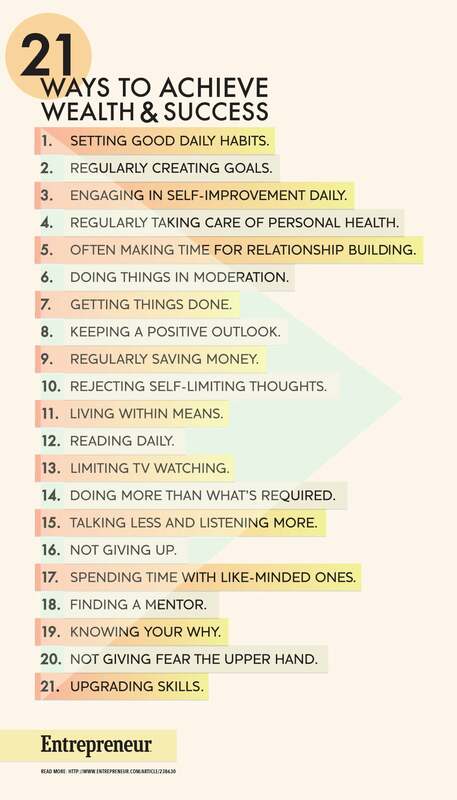 If you're not actively engaged in these 21 things, you are, in effect, leaving money on the table. Successful people are always looking for ways to improve themselves. They read every day and are students of their profession. They don’t spend their time on activities that don't bring them closer to their goals. Don’t put off to tomorrow what you can do today: Accomplish things. All people have fears, but successful people push past them. They don't procrastinate. They get the important things done, no matter the cost. Don't give up when the going gets tough. Successful people hang in there. They pivot. They try something new. They persist. They may have to change their direction, but they keep moving forward. There's a saying that goes, “Show me who your friends are and I’ll show you who you are.” I believe that. People are only as successful as those they choose to surround themselves with. Good associations can help you more quickly achieve your goals. When you know why you're doing something, you will get what you want quicker than if you don’t. Having a purpose is essential to being successful in business and in life. Why do you want to be successful? Why do you really want to be wealthy? If you want to get ahead, there’s only one way to do it: Become better at something than you are today. What's the one thing you can focus on for the next 30 days that will catapult you to rock-star status in your industry? Focus your attention on that. I heard John Lee Dumas from Entrepreneur on Fire define "FOCUS" like this: Follow one course until success. Will you? What I know for sure is that what gets tracked, gets done. If you're truly serious about transformation, be sure to check out my ebook, 21 Ways To Achieve Wealth and Success Plus 21-Day Resource Book.